Sylvester Stallone's family just keeps taking punches. Less than one year after the deaths of "The Expendables" actor's oldest son, Sage Moonblood, and half-sister, Toni Ann Filiti, the star's dog, Phoebe, was found dead after an apparent coyote attack. According to reports, Phoebe went missing a few weeks ago and the Stallones posted flyers throughout their Bel Air, California, neighborhood asking for the pooch's safe return and offering a $10,000 reward. Frighteningly enough, Phoebe's lifeless body was later found on the family's property. Unfortunately, Stallone, 66, is in good company among celebrities who've lost their pets to the dangerous canines. Jessica Simpson famously said farewell to her maltipoo, Daisy, and Ozzy Osbourne and Halle Berry's dogs were also victims. 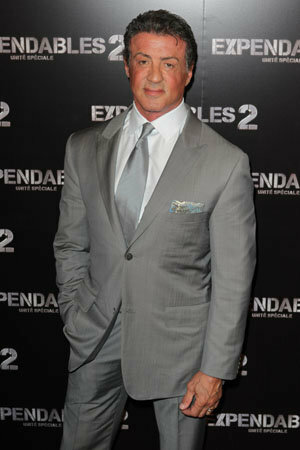 Stallone's son Sage died of a heart attack caused by atherosclerosis on July 13, 2012. His half-sister died of lung cancer six weeks later. While we know Stallone is tough -- he's Rocky, for heaven's sake -- our hearts go out to him and his family. We hope this horrible streak comes to an end soon.